Has she ever considered acting? Lucy: I have a plan. Ricky: I think she's blown her top. Fred: You better get out of this joint before she starts foaming at the mouth and bites somebody. Ethel: Lucy, what's going on around here? Lucy: I feel fine, but you know it's hot in here. Lucy: I uh hope you didn't go to too much trouble. Ethel: What are you doing over here anyway? Massaging his shoulder. I'll rub it if it needs rubbing. 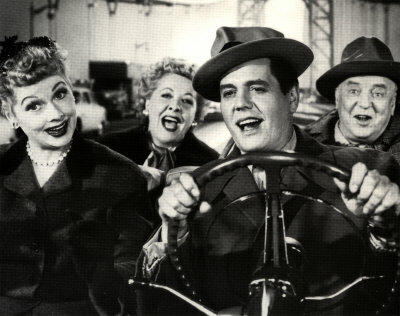 Lucy: What a bunch of jug heads we are. Lucy: Soon as I get to feeling a little better I'm gonna kill myself. Ricky: What-a-matter with everybody, everybody's so grumpy every morning around here. Lucy: I was lulling you into a false sense of security. Lucy: Now it's just been a mistake. Ethel: Yes, and we made it! Lucy: I know there's nothing to it, but I wanna know what it is there's nothing to. Lucy: No, I'm not mad because you're late. Lucy: Fortunately I'm too big for the garbage disposal. Lucy: Why Ethel what's the matter with you? Lucy: If we could just think of a way to make a sneaky switch. Ricky: Well that's your department. You're vice president in charge of sneaky switches. Lucy: Somethings happened to my brain. It's all dried up. Lucy, why don't you answer me? And don't jabber at me in a foreign tongue. Lucy: Isn't that a dilly? Ricky: Well you really fixed yourself up good this time.